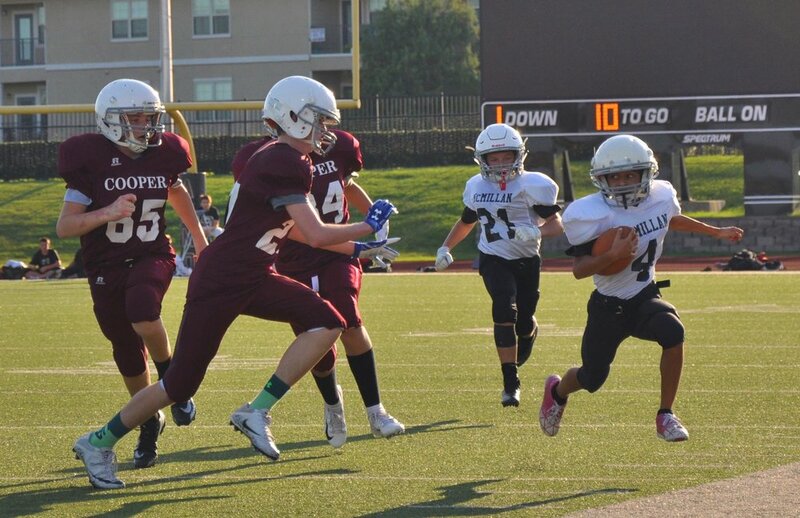 Cooper Junior High’s seventh grade football team played McMillan on Sept. 18 at home. The Patriots wasted no time running 50-yards for a touchdown within seconds of the game beginning. McMillan drove the ball down to the one-yard line, only to be stopped by the Patriots. After turning the ball over deep in Cooper territory, McMillan helped out the home team with a personal foul 15-yard face mask penalty giving the Cooper offense some room to work. The Marauders continued to struggle while the Patriots scored another seven points. After McMillan fell short again, Patriots #25 Darryl King ran 70-yards to score bringing in a 20-0 lead. Patriots #13 Dawson Cleveland then ran up the right side securing the extra point. McMillan finally got on the board with 6:03 left in the second with the score at 21-7. Cooper scored again with 17 seconds left in the second to close out the half up 28-7. The Patriots dominated the Marauders the entire second half with a final score of 40-14 and are now looking forward to playing Willow Springs Middle School at Wylie East High on Sept. 25 at 6 p.m.